The PACE Has Got Talent class takes a bow. "Let me see your eyes, please!" Judy Mandeville is used to making demands. She's taught dance in Spokane for decades. But she delivers commands with a smile, and her relentless positivity belies the image of demanding instructors you might have from A Chorus Line. The students stumble through quick sidesteps as "Rock Around the Clock" blares. They spin and clap. They burst into air guitar and giggle as some get lost in the movement. The music stops and resets. The class gets in formation and tries again. Eyes are up. Sideways slides are smoother. The air guitar is bombastic and the jazz hands wiggle emphatically skyward as the song ends. Mandeville falls in mock exhaustion and joy and students erupt in laughter. "That was the best yet!" she exclaims. "It happened. It just happened!" Grace and Andrea sing a duet. This rehearsal is one of the last for a quarter-long SFCC class called PACE Has Got Talent. The PACE program includes about 450 students of varying disabilities in the Community Colleges of Spokane, and is designed to help them into the workforce. 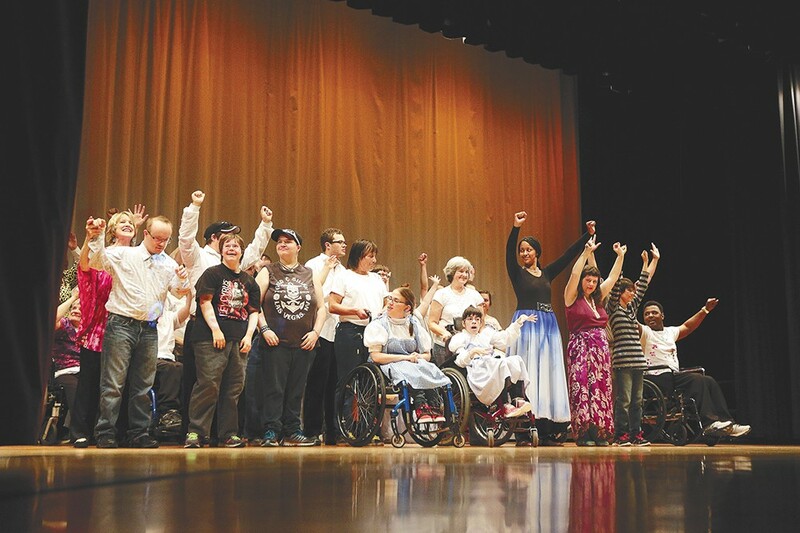 Forty of those students are using the PACE Has Got Talent class, and the process of putting on a big show incorporating music, dance, spoken-word and visual art, to help them get there. It started with Mandeville incorporating performing arts, including a classroom talent show, when she taught autistic students. The results were so striking, PACE administrators created this class open to all PACE students. The talent show has grown from just 20 classmates to a full production that drew hundreds to campus Friday night. "It's a course that utilizes the performing arts to promote community. To promote compassion. To promote confidence," Mandeville says. Linda DeFord, assistant dean of PACE Services, says the students see the class as a chance to share their talents, "but we also know they're learning larger life skills. They're learning management skills, working with other people, taking direction." PACE Assistant Dean Linda DeFord (bottom right) wishes Brian and Adam (in hat) good luck. PACE instructor Eric Moede says the class does help prepare students for the workplace, but it also uses art to help the students learn to recognize, control and express their emotions, something that "can be a real challenge — for all of us." "In this class, we find what these expressive emotions are and how to make them flow," Moede says. "Art allows us to pick our medium, and where and when to let it out." For 40-year-old student Adam Keller, the show has helped in battling his bipolarity and seasonal affective disorder. He recited an original poem two years ago and an inspirational speech last year. This year, he's singing one of his grandparents' favorites, "What a Wonderful World." "I enjoy the teamwork aspect," Keller says of the class. "I also enjoy the speaking up, since that's something that's really hard for me, with my disability." In the green room Friday, decked out in a fedora, Keller is excited, but nervous. Around him his classmates are buzzing before the opening curtain, chatting with Mandeville, commiserating on costumes and happily greeting well-wishers. In just a few minutes, months' worth of work will come to life on stage. This year for the first time, Mandeville and Moede reached out to local artists to work with the class, including musician Jenny Anne Mannan, who provided violin and banjo accompaniment. Mannan's involvement started with a chance meeting with Mandeville, who called her the next day. "Judy made it very clear that she didn't want us to think our participation legitimized the show in any way," Mannan says. "She takes what her students do very seriously, and as far as she's concerned, they're all stars already." The experience of working with the class — preparing and delivering the final show — is one that Mannan found recharged her. "It's so revitalizing to the idea of what the arts are for," Mannan says. "To see them used and expressed in this way — and see that no matter what anyone's story is, there's a common language that everybody speaks — it's such a good reminder that these are what the arts are all about." The two-hour show goes by in a blur of singing and dancing on stage, and laughter and tears among the families and friends in the audience. 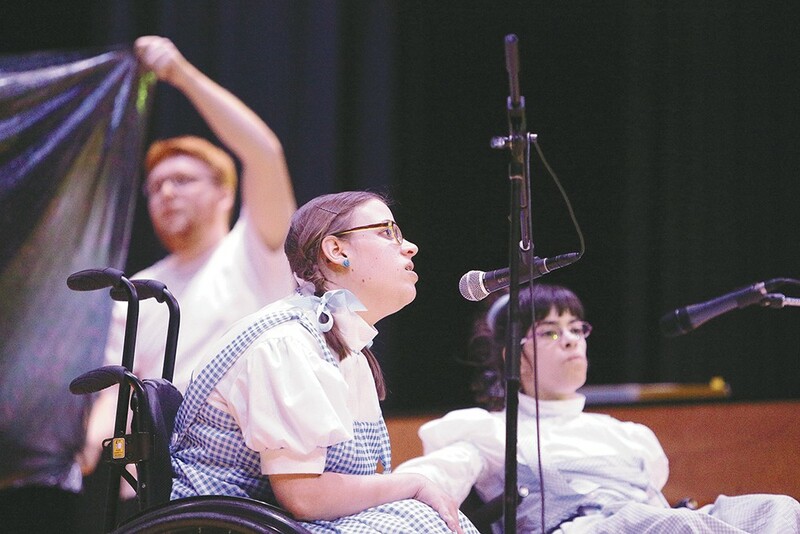 Between solo songs and duets, the wheelchair ballet, piano pieces and poems, there's no denying the name of the class, which the 40 student performers loudly proclaim after their final run through the grand "Rock Around the Clock" finale.